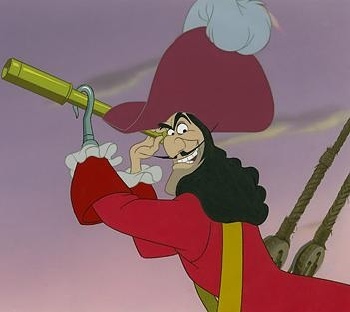 The song and the cartoon evoke two images of piracy. The song suggests what is perhaps closer to the reality of piracy, self-interest and self-enrichment that need not be enlightened. The cartoon depicting Captain Hook from the Disney cartoon Peter Pan, suggests the romance of the pirate. The pirate is not, ultimately, very dangerous and the ideal villain with whom a boy might battle to prove his bravery. This is the pirate of the Pirates of the Caribbean series of films and of many of the pirate films of the early American cinema. The pirate of cinema romance is not even an anti-hero, a humanized bad man or woman with redeeming qualities. The pirates of the early cinema are often like Captain Blood, the Rafael Sabatini character who is driven to piracy by circumstances beyond his control, even the “bad” pirates are more like Captain Hook’s pirate crew than the real pirates of the high seas. As a boy whenever we played “cops and robbers” or pretended to be swashbuckling seafarers it was always the persona of the robbers and the pirates we most wanted to assume. What I always enjoyed about this John Stewart song was the way he played with the image of the child pretending to be the pirate and imagining the back porch to be the deck of a pirate ship. Michael Chabon in an article for The New York Review of Books, “Manhood for Amateurs: The Wilderness of Childhood”, writes about the role of adventure in the life and development of a child. I suppose his point is one that has been made many times before, that children need to take some of the risks that children always enjoy taking if they are to develop into confident and successful adults. As a culture, though, we are becoming a bit overprotective and as a result children may not be learning some important lessons about risk taking that help prepare them for adult life. I remember in the neighborhood where I grew up there was a water pipe that spanned a huge ravine that was hundreds, to a child maybe thousands, of feet deep. It provided water, I suppose to homes on both sides of the canyon. As children my friends and I would climb the fence designed to keep us off the water pipe and would walk the pipe from one side of the canyon to the other. It was great fun, but probably not the wisest thing to do. I know I wouldn’t let my child do anything so foolish. But to what extent has my willingness to take risks as an adult been shaped by my eagerness to take risks as a child. Chabon ends his article, “Art is a form of exploration, of sailing off into the unknown alone, heading for those unmarked places on the map. If children are not permitted—not taught—to be adventurers and explorers as children, what will become of the world of adventure, of stories, of literature itself?” To a great extent the stories we shape as adults had their beginnings in the stories we imagined as children and perhaps our willingness to try something new and different, whether it’s writing a story or attempting something that seems to be bit more than our abilities, on the surface anyway, will allow us to achieve were nurtured by the foolish risks, like walking across a canyon on a water pipe, we took as children. The pictures above and below are both of the notorious pirate Captain Kidd. 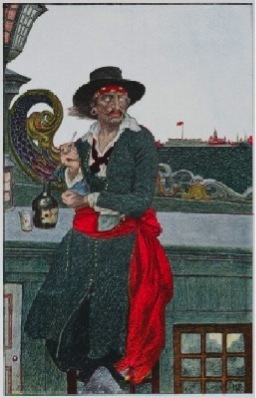 The one above is a fanciful depiction by Howard Pyle for his book on pirates and the one below of the eighteenth century gentleman who was the real Captain Kidd. The real captain would not have called himself a pirate at all but rather a privateer. A privateer was a pirate who committed piracy in the service of the queen, or the ruling powers of the day. 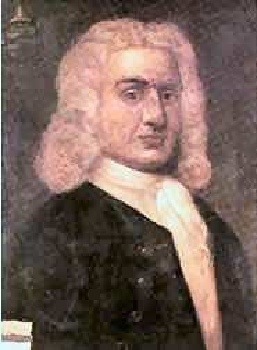 Unfortunately when Captain Kidd was finally caught those for whom he committed piracy in “the service of the queen” disavowed all knowledge of his activities. He was hung and, according to Wikipedia, his body was left hanging for many years in an iron cage as a warning to others considering a career path similar to that of the “good” captain. Of course Kidd was following in a long established tradition. The Spanish conquest of the New World was made a bit less profitable by the work of privateers in the service of Queen Elizabeth. Among the more famous was Sir Francis Drake, who, like Mick Jagger, was knighted for his service to the British Empire. Growing up in California I studied in high school of Drake’s exploits along the California coast. He claimed California for Britain not by planting a flag but by nailing a coin to a post. The coin of course had Queen Elizabeth’s image on it and was intended to show Elizabeth as the ruler of this new land, but I think it is appropriate that money and not the “Union Jack” was used to claim the land because the exploration and colonization of the New World was, at its heart, a mercantile enterprise. 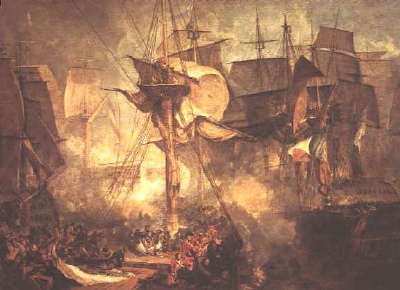 The painting by Turner captures the reality and the romance of the pirate “adventure.” In every pirate film I saw as a child there was a scene where pirates swung on ropes from one ship to another, the decks of both ships filled with gun smoke from the ships’ cannons and falling debris as sword fights and other forms of hand to hand combat took place on the deck of one or both of the ships. But if we stop to think at all seriously about what is depicted in the painting the reality of what is taking place cannot be avoided. People are dying and they are dying in horrific and painful ways. Death in the movies, especially the movies of the 1930’s and 1940’s has a romance all its own. It is heroic, often over quickly, and rarely strayed far from the world of “let’s pretend.” Besides, the dying hero always returned in a year or two in another film, so whatever death was it certainly was not permanent. But the painting if carefully considered suggests a tangled mess of broken and burning wood and canvas and an awful lot of blood and dying flesh. But it is one of the jobs of stories and story telling to provide us with the examples we need to help us live meaningful lives that are consistent with a set of values that shape our human experience. When the cause is just all this bloodshed is an act of patriotic self-sacrifice, and what nation can hope to survive if none are willing to take on such a sacrifice. But when the cause is unjust this death and destruction suggests the waste that accompanies human ego and ambition. When is a pirate a privateer and when is the outlaw the true seeker of justice? Billy the Kid is one of America’s legendary outlaws. I think it is interesting that “The Kid” and “The Captain” both had the first name of William, well actually William was an alias and not the kid’s real name, but as far as the legends are concerned both “outlaws” shared the same first name. Billy the Kid became a romanticized figure of the Wild West and is joined by other outlaws, like Pretty Boy Floyd, who had more in common with Robin Hood than Al Capone. But if Billy in fact did all that he was accused of doing perhaps it is Pat Garrett who should receive the lion’s share of the attention. 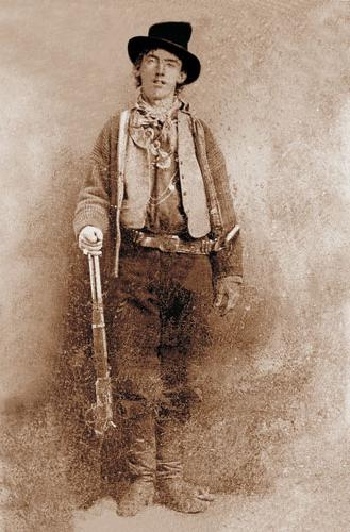 But than the legend of Billy the Kid was largely Garrett’s invention, and served to enhance the lawman’s reputation and “bona fides” as a true western lawman in the mold of Wyatt Earp. Perhaps the pirate is the bridge between the knight of medieval romance and the cowboy of western romance, who in turn evolved after a fashion into the hard boiled detective. Sam Spade tells us he trades on a reputation for being a little bit crooked, that it is “good for business.” In the ideal western romance the bad guy often has more in common with the outlaw (The Ringo Kidd played by John Wayne) in John Ford’s film Stagecoach than with the actual Wild West bandit. Real bandits and outlaws are not heroic or likable, but there is something in the human psyche that does not like people who are “too” good or “too” virtuous. The true hero of the Grail Quest is Sir Galahad but the readers of the King Arthur stories often find Sir Lancelot and Sir Gawain more interesting characters. In fact even Lancelot is a bit “too” good when it comes to too many things and it was Gawain who captured the imaginations of many during the Middle Ages in stories like Sir Gawain and the Green Knight or Sir Gawain and Lady Ragnell. But Malory’s Gawain has some very troubling, though also very human, failings. Growing up in Los Angeles one of the local television channels ran a program called Million Dollar Movie. This was, for a child, wonderful. They would show the same movie every night for a week. Of course this was no fun if the film was uninteresting to the ten year old imagination, but if it were a film like Captain Blood it could be watched over and over again. As a child I would watch this film and other like it and the next day find an old curtain hanger that could be imagined into a sword and engage in battles like the one shown in the film clip. This was probably not the safest thing to do, I probably wouldn’t let my child do anything so foolish, but it was great fun and it opened up imaginary worlds for me. Of course the plunder and the rewards were all imaginary as well. Though I tried, the ice cream man would not take the “play” money I had accumulated in my high seas adventures. These thoughts were also provoked by a couple of other articles I read this week. One was a review of a new book by Chris Anderson, Free: The Future of a Radical Price. The main idea of this book is that we are evolving into a culture that finds other ways to generate profits than by charging for the merchandise it produces. There is an irony of sorts here in that the author, Chris Anderson, got into a bit of trouble for making “free” use of copyrighted materials found on Wikipedia. The material may be free to whoever wants to make use of it, but good manners, not mention sound editorial practice, dictate that the sources be identified. This is piracy of a different kind. At the heart of piracy, and all theft I suppose, is the desire to get something for nothing. Of course a lot of hard work goes into being an effective pirate, or thief of any kind and as a result little if anything is gotten for nothing if we include our “efforts” as a cost to be paid. Anderson did, after all, have to write quite a bit of his own material in order to take advantage of the opportunity to steal a page or two from Wikipedia. The flip side of piracy and the “free culture” was suggested by another article this week published in The Guardian. The article, “Authors in revolt against plans to vet them for school visits”, reports on a group of authors of children’s books, Philip Pullman among them, protesting a piece of legislation recently enacted in Britain. This new law requires authors to pay £64.00 (about $100.00, I think) for the privilege of donating their time to speak to children. The intention of the law is good, it wants to protect children from those that may do them harm. But as is pointed out, these writers are never alone when they visit schools but are always accompanied by other adults, primarily teachers and administrators in the schools. The end result is that many of these writers will no longer make a gift of their time to speak at schools. It is a tenet of our culture that nothing is free; everything comes with a cost, even if we are not the ones paying the cost, or at least not directly. Most online “freebies” are paid for by advertising that is directed at the kind of people likely to use the “freebie”, which means the cost of what is gotten for free is included in the cost of the merchandise we are being tempted to buy when we use the service. But are there other costs to a culture that grows up believing it does not have to pay for what it consumes, that believes itself to be entitled to whatever it needs or enjoys? What happens to news when it is provided at no cost to the consumer of that news? Who is paying for it and do those subsidizing newspapers have a say over what is contained in that newspaper? In a sense it is in paying for what we use that gives us a say over what goes into the products that we use. On the one hand we will pay large sums of money to buy products, everything from shirts to automobiles, that are advertisements for their manufacturers, piracy of a different ilk. The only journeys that we take that are truly free are journeys of our imagination, though, as with pirates, we pay for these with a kind of effort; time needs to be taken to dream and to imagine. The stories that I read as a child and read today as an adult stimulate and inspire the imagination; they give me the raw materials my imagination needs to construct stories of its own and to craft a human and humane existence. The depth of my character and the motivations behind what I accomplish are often revealed in the stories I hold sacred, whether they are stories of my own making or stories I have pirated from other authors.